Swami Sivananda Radha, took to heart the request of her guru, Swami Sivananda, to start an ashram and many centres of Light in the Western world. She founded Yasodhara Ashram in 1963, and her next mission was to build centres in the city for people to find community and support each other in yoga. The first centre was opened in 1982, in Calgary, Alberta. Centres continued to sprout up in Ottawa, Victoria, Burnaby and Spokane, Washington. 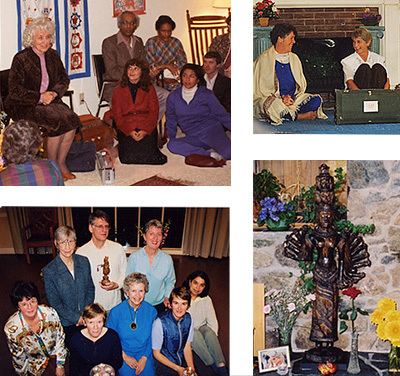 Students who trained at Yasodhara Ashram also took Yasodhara Yoga home to England, France, Portugal, Trinidad and Australia, where international groups have formed. Originally called “Shambhala Houses,” (implying a place of happiness that comes from spiritual study), the centres later changed to “Radha Houses” and “Radha Yoga Centres” to honour Swami Radha. In 2013, the centres took a new name to become “Yasodhara Yoga Teachers & Centres,” to connect back to Yasodhara Ashram as the source of inspiration and teacher training. Over the years teachers in cities and towns have been offering classes from their own homes, from yoga studios, community centres and art studios. We have experimented with owning commercial buildings that doubled as home for Ascent Magazine in Montreal, and Radha, a vegan restaurant in Vancouver. Throughout our evolution, the guiding principles have stayed the same: to further the yogic teachings as interpreted by Swami Sivananda Radha and to support the ethics of yoga, including honesty, integrity, moral conduct, non-injury, non-greed, loyalty, clarity of motivation, dedication of the ideals of spiritual life and consideration for others.